Unit conventions, national conventions, and the like: part of the framework of Bahá’í administration. Every five years, Bahá’ís throughout the world gather together at the Bahá’í World Centre in Haifa, Israel, to attend the Bahá’í International Convention, which has been called the world’s “only worldwide election”. The primary purpose of the convention is to elect the Universal House of Justice, the institution which serves as the head of the Bahá’í Faith, in a reverent, joyful process one friend of mine described as “spiritual democracy”. The global process that results in the election of the Universal House of Justice begins with Baha’is in more than 100,000 cities and villages around the world, from Canada to Vietnam and everywhere in between, who gather at unit conventions to elect delegates from among their localities. These delegates subsequently gather together at national conventions to elect national administrative bodies known as Spiritual Assemblies. Once every five years, members of these National Spiritual Assemblies are then tasked with electing the Universal House of Justice at the international convention. In a unique electoral process, all forms of campaigning, electioneering and nominations are strictly avoided. Rather, after prayerful reflection, the assembled delegates silently and privately wrote down the names of nine individuals who they felt would be best able to serve on the institution. 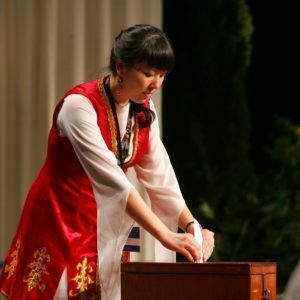 For more than three hours, the representatives then filed across the stage to deposit their votes in a simple wooden box. The following day, the result was announced, and the new membership of the Universal House of Justice received a warm and reverent welcome from the gathering. Absolutely nobody talks about how they think the votes will go. No one mentions whom he or she voted for — no speculation, no “preliminary reports”, no “buzz”, no “spin-room”… period. For the Baha’is, this election represents a sacred spiritual endeavor, not a popularity contest or a political exercise. Because the worldwide Bahá’í community has been growing year over year—not just in numbers, but in its maturity and in its capacity for concerted, systematic action—there are always exciting things to talk about. Contributing to the delegates’ consultation during the last convention were the 2013 Ridván Message and the 1 May 2013 message from the Universal House of Justice, as well as a documentary film entitled Frontiers of Learning, which showcased the community development process underway in four different Bahá’í communities in different parts of the world: Norte de Bolivar, Colombia; Lubumbashi, the Democratic Republic of the Congo; Toronto, Canada; and Bihar Sharif, India. The Twelfth International Bahá’í Convention will take place next year (2018), and there will be plenty of things to talk about there, too. Since the convention will fall between the two Bicentenary years—the Bicentenary of the Birth of Bahá’u’lláh in 2017 and that of the Báb in 2019—delegates will surely be occupied with reflections on the effects of Bicentenary celebrations on both the Bahá’í community and the wider community throughout the world, along with plans for the following year’s celebrations. The celebrations already seem to have tapped into a wellspring of creativity within the Bahá’í community—who knows what 2019 will bring? The original post, international baha’i convention: a global community reflects, is one of the most popular posts on doberman pizza. Photos courtesy of the Bahá’í International Community and the Bahá’í Community of Vietnam. To follow up on my earlier overview of the 11th International Bahá’í Convention held this year, I’ve put together the following informal translation of an account written by the Vietnamese delegates, which was published on a popular Vietnamese interfaith portal. It gives a good overview of the activities that took place at the Convention, and the joy and love with which the Vietnamese friends were welcomed by their fellow delegates. The 11th International Bahá’í Convention was held in Haifa/Akka, Israel, from April 25 to May 2, 2013. In document No. 260/TGCP-HTQT, the Government Committee for Religious Affairs approved the application of seven members of the National Spiritual Assembly of the Bahá’ís of Vietnam to attend the event, including: Nguy?n Th?c; Nguy?n Hoàng L?c; Nguy?n Th? Lâm; Lê Nh?t Ph? ?ng H?ng; Di?p ?ình H?u; Bùi Ph? ?c K? Nam; Nguy?n ?ình Th?a. The delegation from the Bahá’í Community of Vietnam travelled to Israel on April 24, and returned to Vietnam today, May 5, via Turkish Airlines. The assembled delegates then began to take counsel together, sharing “their thoughts, experiences and insights as part of a global learning process”. Their consultations, writes Higgins, touch on “community building, on social and economic development projects for the poor and underprivileged around the globe, on the education of the children and youth. They encourage others in their success and struggles, crisis and victories. 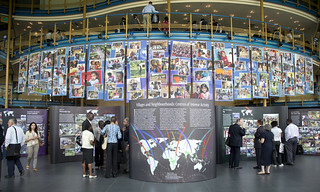 They focus on the work of Bahá’ís everywhere, making the world a better place for all.” Feeding their consultations was a letter addressed to the convention by the Universal House of Justice, outlining the work that stands before the Bahá’í community “as it strives to contribute to the spiritual and material advancement of civilization”. Also contributing to the delegates’ consultation was a new documentary film entitled Frontiers of Learning, which showcases the community development process underway in four different Bahá’í communities in different parts of the world: Norte de Bolivar, Colombia; Lubumbashi, the Democratic Republic of the Congo; Toronto, Canada; and Bihar Sharif, India. Baha’i Counselor George Soraya of Indonesia gave a rousing keynote speech. He emphasized Baha’i principles of obedience to government, peace, education, loyalty to government, the oneness of humanity, Baha’i non-participation in partisan politics, cooperation with government, non-violence, and obedience to government. Another moving address was from a beautiful lady [Mrs. Tran Thi Bich] who was the second Hanoi Baha’i, having been enrolled 20 years ago by the first believer, Dr. Dao An Son. Sadly, the latter’s whereabouts are currently unknown, although the National Spiritual Assembly made every effort to find her during the lead-up to the celebration. Mrs. Bich is very dear to Quynh and I; we spent a lot of time visiting with her and her family while we were in Hanoi getting to know each other. She’s very steadfast, strong and sharp. The Baha’is of Hanoi had to endure quite a lot in the past twenty years, especially before the community was officially recognized, so I can imagine her account must have been very moving. More than 300 Baha’i dignitaries and followers across the country attended the fifth National Congress of the Vietnam Baha’i community in Hanoi. 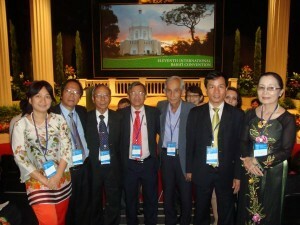 The event was held on the occasion of Ridvan and the 20th anniversary of Hanoi’s Baha’i religion. The Vietnam Baha’i community, which was recognized as a religious organisation by the Government Committee for Religious Affairs in 2008, has made great contributions to the development of the community and society. In recent years, the organisation has held many charitable activities and educated its followers on healthy spiritual values. The Congress discussed and approved the directions on the community’s development from now until 2013, as well as elected the Baha’i Religious Spiritual Council in Vietnam for the 2012 – 2013 term. What really struck me this year, of course, was how foreigners were welcomed into the proceedings. The video below shows Michael and Selena Orona and their three children performing two Baha’i songs at the 20th anniversary celebration for Hanoi’s Baha’i community. Michael is a diplomatic advisor on human rights and religious freedom with the U.S. Embassy in Vietnam. The Baha’i Community of Vietnam held its fourth National Congress in Phan Thiet city, the southern province of Binh Thuan, on April 23 and 24. 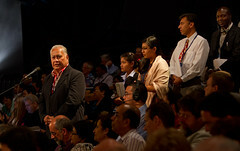 More than 300 Baha’i dignitaries and followers nationwide attended the congress, which also saw the participation of representatives of the Government’s Committee for Religious Affairs and the Baha’i advisory board for Asia and the Board of Trustees of Huququ’llah for Southeast Asia. 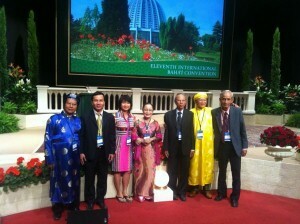 The congress elected a nine-member religious council of the Baha’is of Vietnam for the 2011-2012 term. It also set forth key tasks with the emphasis on mobilising Baha’is to live up to the motto of “living well in one’s life and one’s faith” and strengthening the nation’s great unity and solidarity with other religions. Introduced into Vietnam in 1954, the Baha’i community now has more than 7,000 followers in 43 cities and provinces, mostly in central and southern regions. The Baha’i Community of Vietnam has been recognised as a religious organisation by the Government’s Committee for Religious Affairs in July 2008. This article—a short one to be sure—isn’t a direct translation of the Vietnamese one, nor is the French article. The original reads something more like the article on the Can Tho convention in 2010 I blogged last year, with a lot more references to the Baha’i Faith being completely lawful and being in full accordance with regulations, etc. Despite not saying much, of course, the English article’s at least correct. I’m mostly just surprised they included the word “Huqúqu’lláh”. Anyway, as soon as I get a little more time, I’ll take a stab at translating the Vietnamese and French articles for a little comparative coverage. Keep your eyes peeled. And if you’re interested in reading more articles like this, then why not follow me on Twitter and let me know? Read about last year’s Baha’i National Convention in Can Tho. TORONTO, ON, 27 April 2006 (CBNS) — Bahá’í delegates from across Canada will gather on Friday morning in Toronto for the 57th annual Bahá’í National Convention. The convention runs until Sunday, April 30th. Elected by their fellow believers across Canada, now numbering more than 30,000, the delegates will begin the convention with prayers for the safety of Iran’s Bahá’í community, that country’s largest religious minority. do baha’is believe in ghosts?